Must. Not. Think. Bad. Thoughts. About. My. Camera. Thief. 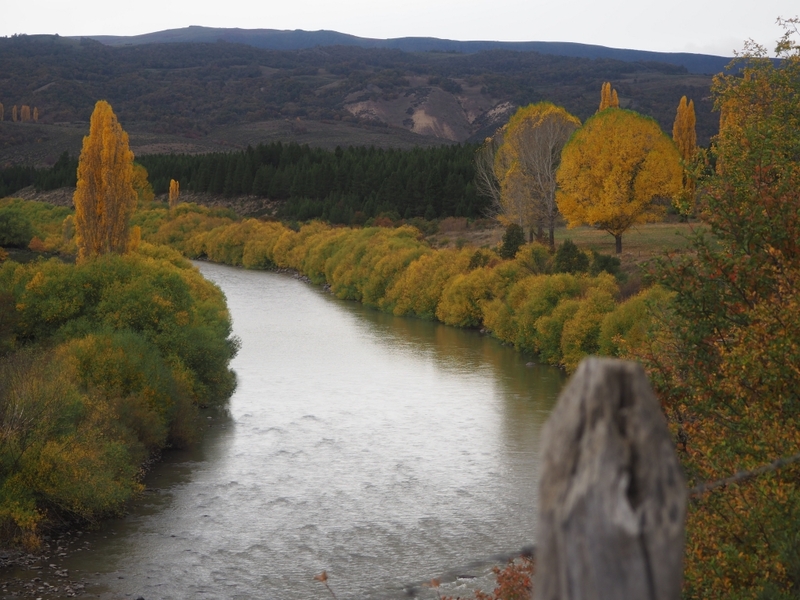 If you like photography, Patagonia is not somewhere you want to be without your favourite camera. 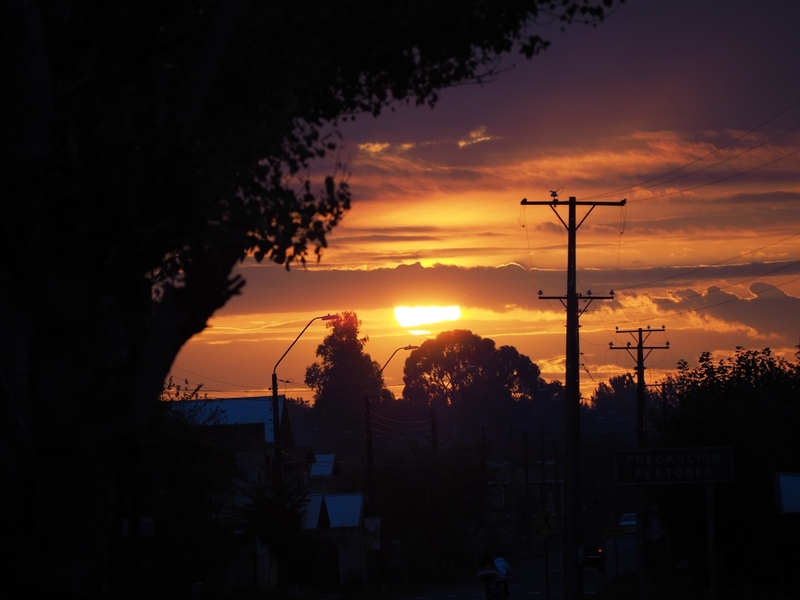 With Patagonia now very much in my sights, losing my camera in Valparaiso was, we might say, ****-ing tedious. With the seasons changing and time relentlessly slipping away, waiting for two weeks in Santiago for the delivery of a newly ordered Olympus EM10mkii would have been far from ideal. Lamenting its loss and repeatedly playing over scenarios in my mind of how it could have happened, I was badly in need of some distraction. 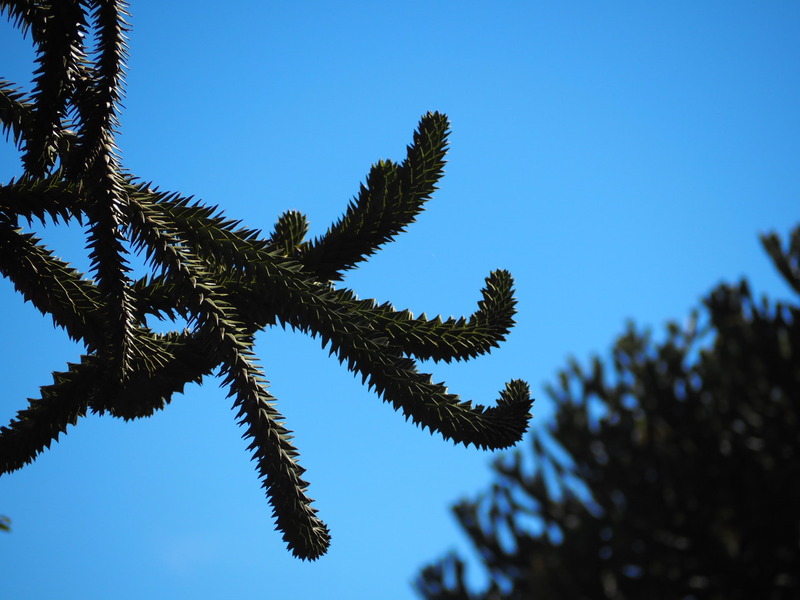 The beautiful Monkey Puzzle tree (Auracaria) comes in all shapes and sizes. Found in particular abundance on the route to Lonquimay. Chilean Lake District. Continuing with my rule to take the bus on roads with potentially dangerous traffic I bumped myself 200 kilometres south of Santiago to Curicú and headed up towards the border of Argentina for the second (and not last) time this trip. 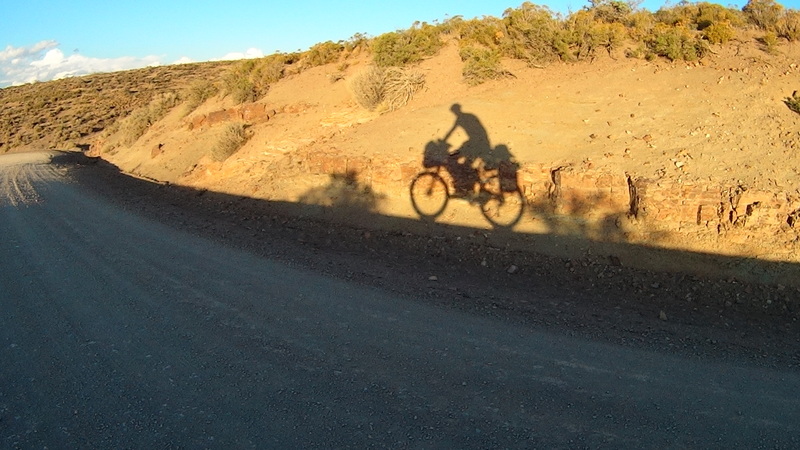 Some steep climbing and a quiet border entry take me out of Chile and into Argentina. (This and next few shots taken with my Sony Actioncam). 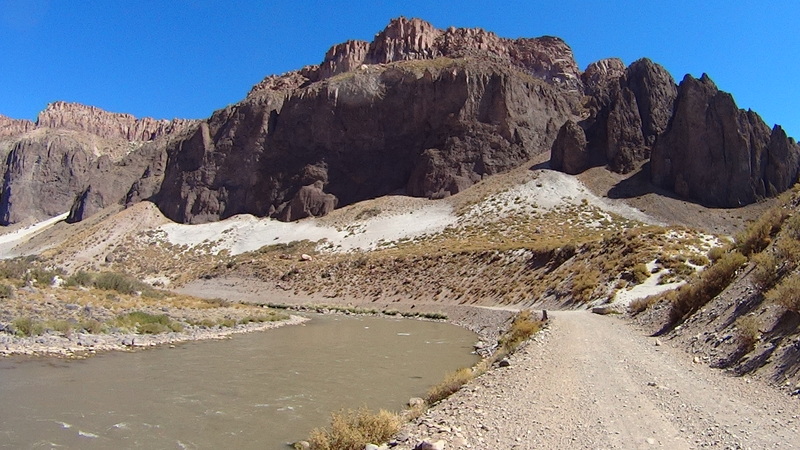 I find Argentina’s roads somewhat rougher and sandier but the views are no less spectacular. In need of a snooze this rock seduces me into lying by its side out of the wind in the dirt. 10 kilometres of rough sandy undulating roads later I realise I am without my helmet and lose two and a half hours in an immensely tedious return trip to recover it. One of the nights in Argentina on the Route 40 sees me camping by a hostel to avoid being molested by the town drunk in the free municipal camping. 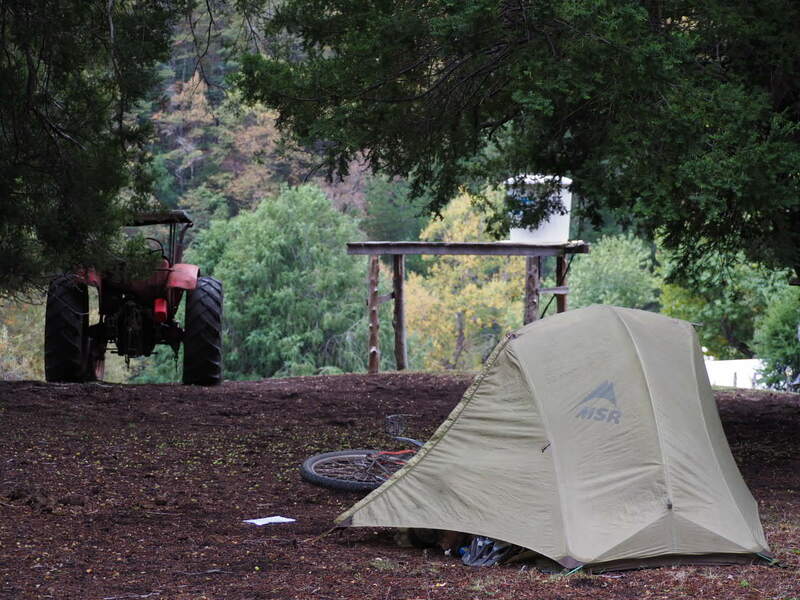 I set up the tent in the designated camping zone and notice a car in a garage 20 metres away. The risk crosses my mind but I quickly disregard the possibility of being run over; there is ample passing space. I cook up a steak feast with my tiny saucepan and two hours later get into my tent and start changing into my “pyjamas”. At this point I hear the car start up and reverse. Paranoia (or soon to be justifiable concern) sets in and I poke my head out of the tent only to see the car one metre away reversing directly towards my tent with no signs of stopping. I leap out of the tent screaming and smash my hand against the side of the car. The car stops. The tent is part below and part touching the bumper and I’m standing next it naked. Arrrggh!!! I then re-pitch my tent, flabbergasted at the near miss, poking my head out of the tent at the slightest hint of car noises in the vicinity. 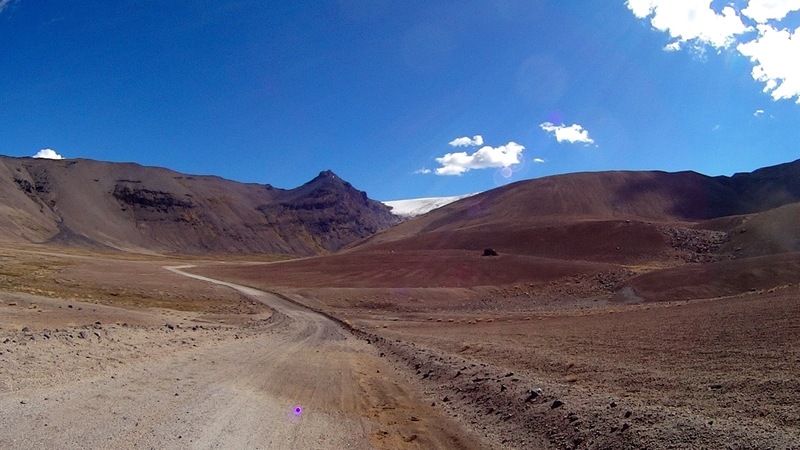 After some Ruta 40 paved / ripio action and a scenic side detour trip via Tromen volcano to Chos Malal, I choose the route via El Cholar to El Huecú which proves to be surprisingly arduous. 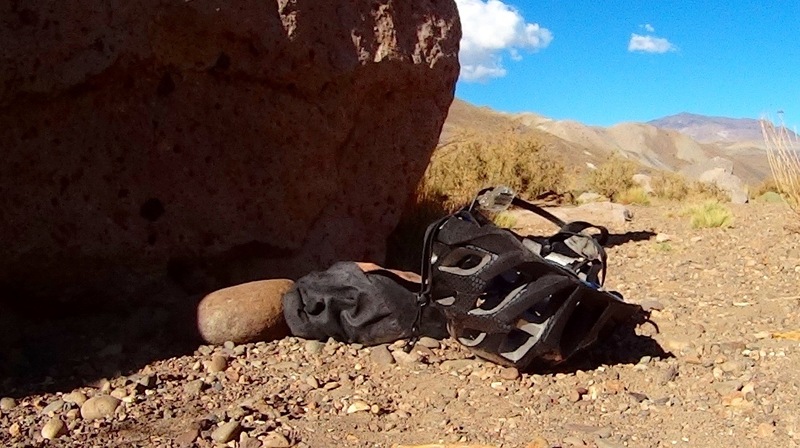 Whilst turning a steep downhill corner at low speed a strong gust of wind destabilises me after my front tyre hits a fist sized rock; suddenly I find myself flying over the handle bars, impacting the dirt and rolling several times down the hill. I brush off the dirt and continue on into the random gale force winds. Tired, low on water and not in the mood, the steep rolling hills and an unexpected final steep climb spark off a rather unhelpful attitude. I try to cultivate my inner zen and use this shadow to alter my futile emotional state. 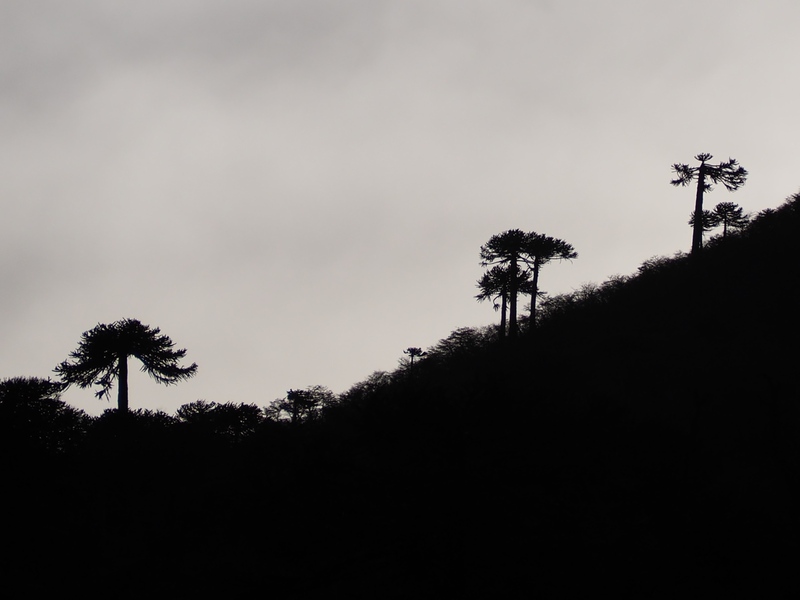 A night in Huecú and I start the climb up to Copahue. 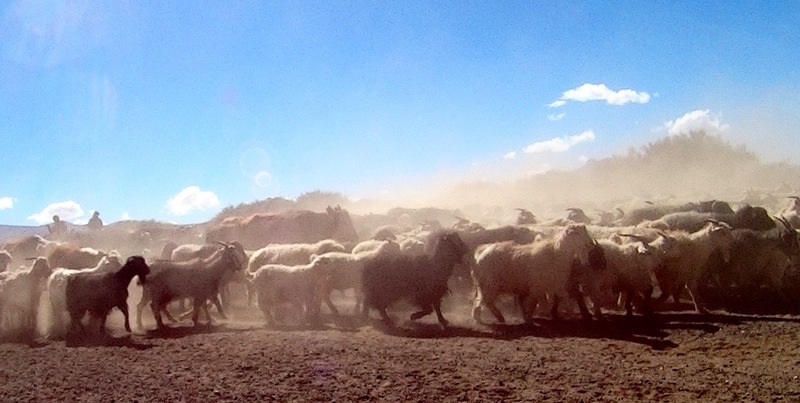 Endless herds of horses, sheep and goats pass, shepherded by their owners on horseback; heading down to warmer altitudes for the winter. Should I really still be heading south? I think to myself. In Ralco I leave the bicycle with a local priest and bus back to Santiago to retrieve my camera and stay with my friend Daniela. A two day trip turns into several days but finally I am on the bus back south with the same model camera in hand. One of my first shots with the new camera in Santa Barbara as I hitch the final leg back to Ralco. I am grateful for the two young ladies who pick me up but less so for the scary fast uncoordinated driving on the dangerous road bends. It is with some relief to arrive in one piece. I’m not a religious man but the church does seem to cultivate the good in people. Jaime, the local Ralco priest, feeds and puts me up for the night after taking good care of my machine for the week. Something I appreciate greatly. As I battle the steep undulating roads. 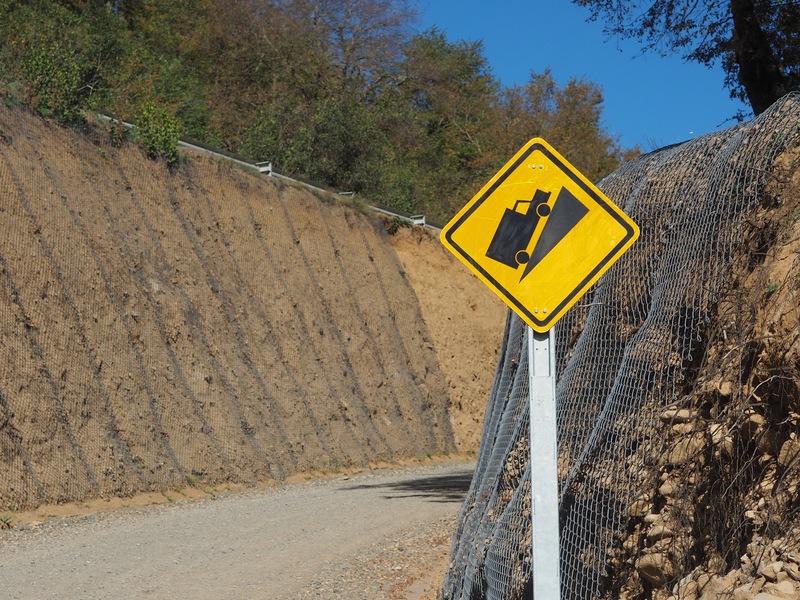 In this case, it felt steeper than the sign suggests. Autumnal hues serve as constant reminders of my incredibly tardy progress south. 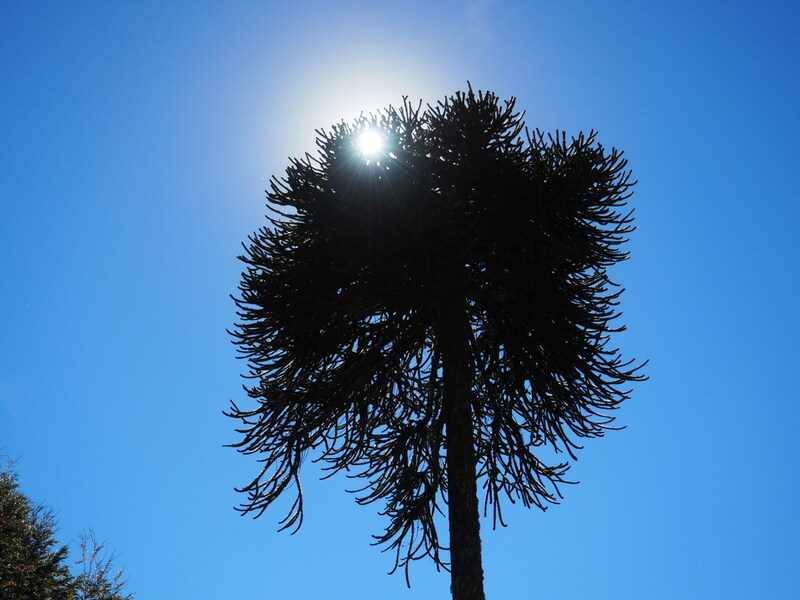 After Lonquimay, the monkey puzzle trees (auracaria) start playing a prominent feature of the trail. And create a delightful addition to the scenery. 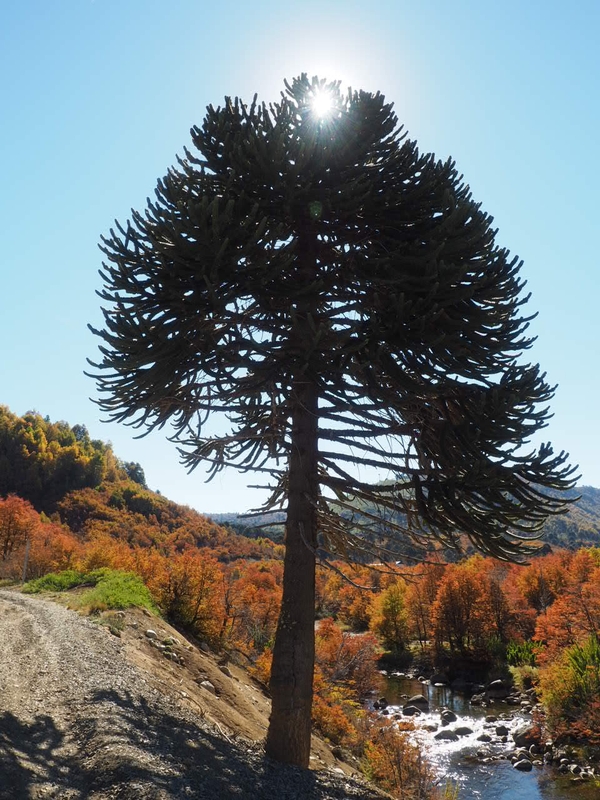 As the road rolls on, the combined effects of the trees and the tranquil sunny afternoon cause a heady sense of peace and I consider stopping to soak it all in but I am spurred by thoughts of freezing Patagonian winds in the not to distant future. After the pass towards Melipeuco there is a dramatic change in vegetation. In the sense that it’s mostly dead. 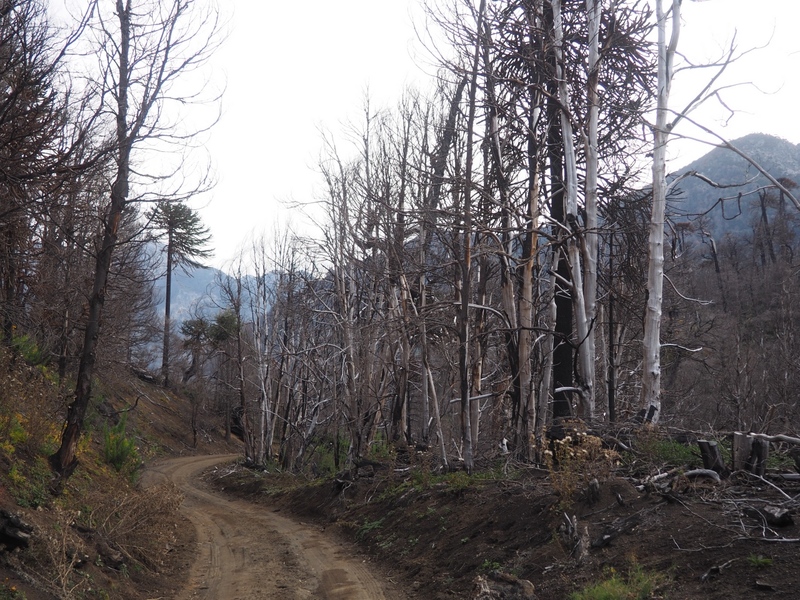 Forest fire is held under suspicion as the main suspect; a not uncommon problem in Chile. I’m also grateful for these new lightweight gore-tex Mammut boots that I picked up in my size (US 13) in Santiago a few days before. Although a very expensive country, as far as Latin America is concerned, their capitalist approach to consumerism does provide some benefits for kit options. So far, very happy with the choice. 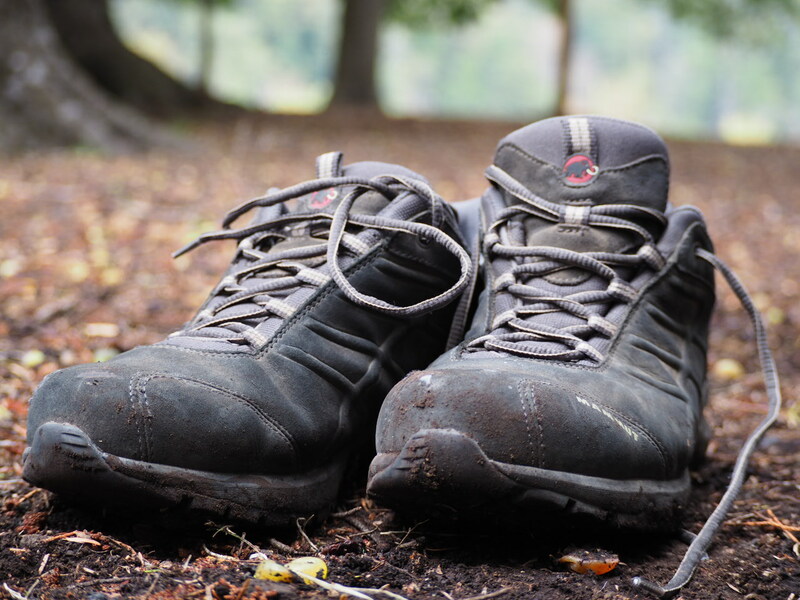 My previous North Face approach shoes had served me well surviving a year and four months of constant use and abuse. However my feet were getting wet at the slightest hint of drizzle in their notable deterioration. 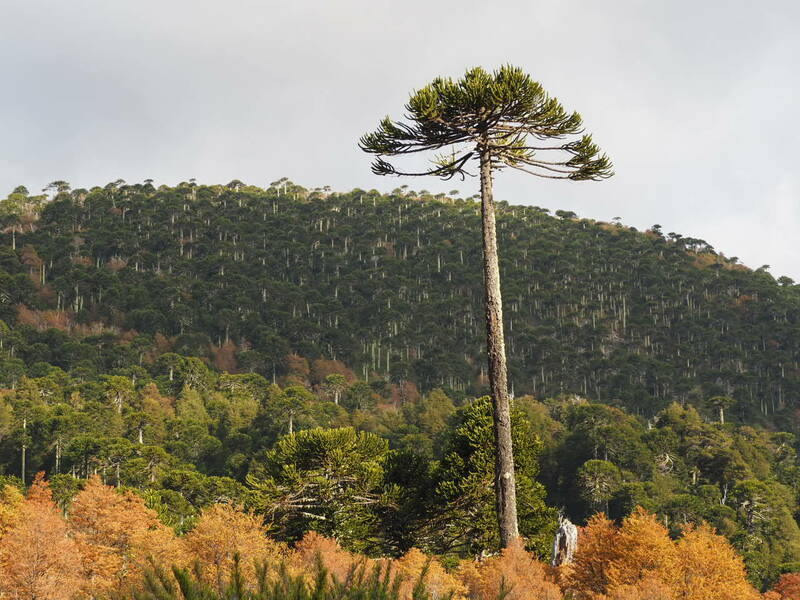 Not ideal if heading into the Patagonian rainy season. 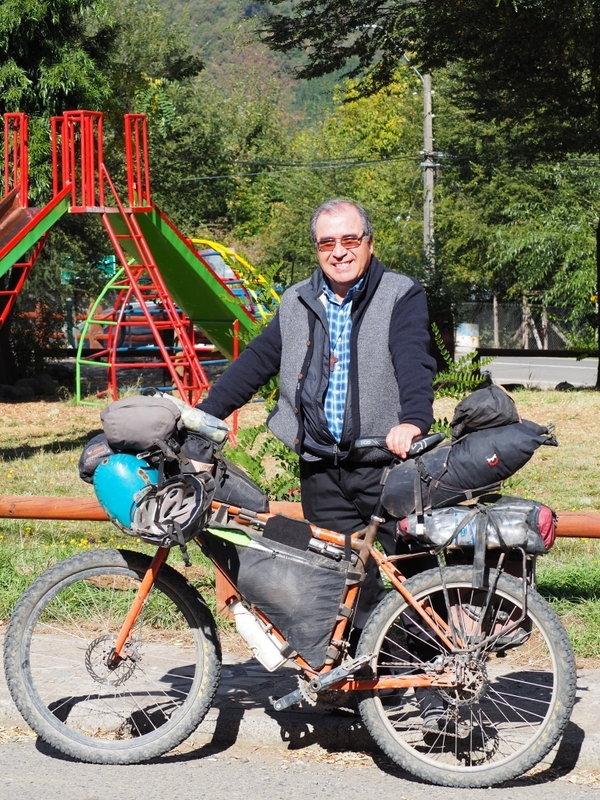 After days of hardly speaking to anyone, let alone in my native tongue, it was a great pleasure to have a chance encounter with fellow bikepacker Peter Koch coming the other way. Perhaps heading in the more sensible direction: north. An early lunch snack and an hour and a half goes by before we part ways. I whiz through Melipeuco and continue on the flat paved road to Cunco enjoying a mighty feast at exceptional value (see end notes for details). It’s night by the time I set up camp six kilometres down the road. 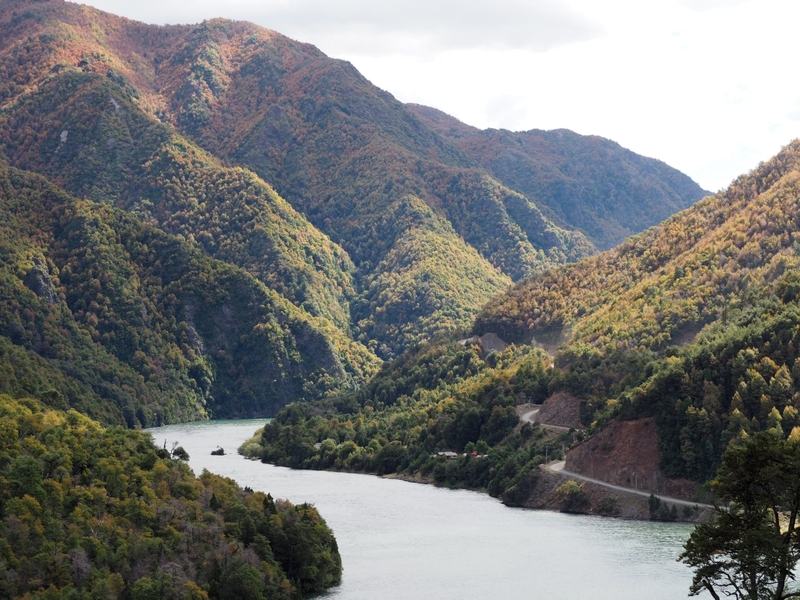 I set off wrapped in my waterproofs the next morning as the heavy rain makes for a tough 86 kilometres to Pucón. 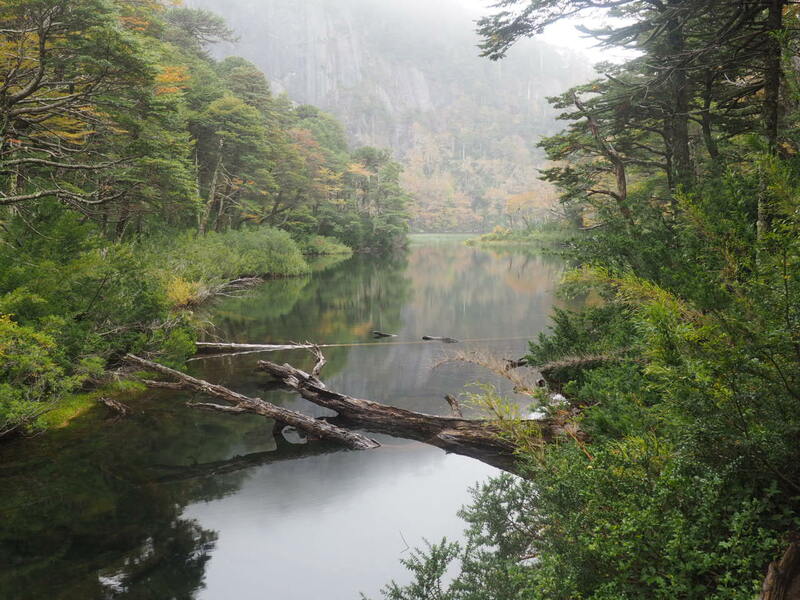 Even on this drizzly day, I find some fine views on a day hike to Huerquehue National Park… (1 hour / 2000 pesos) from Pucon by bus). 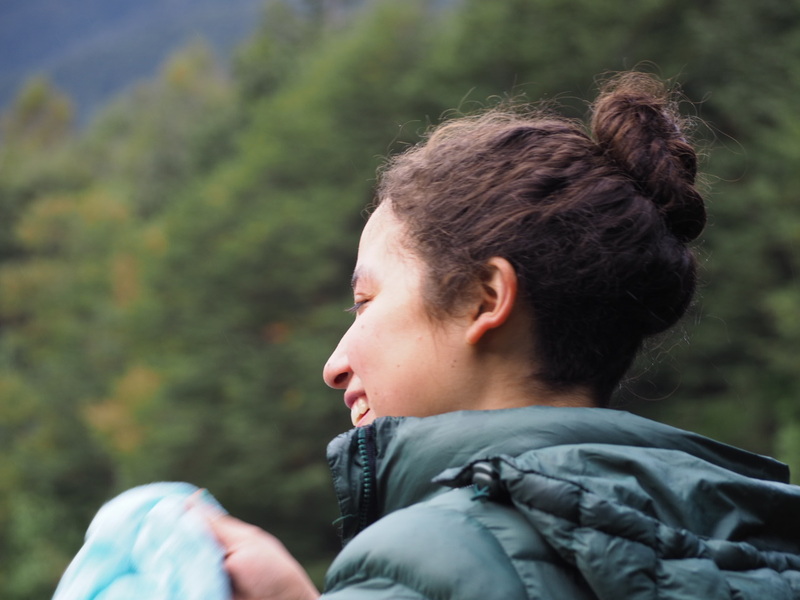 …that I share with Huenú, my enchanting Argentinian friend who I had met in Copahue a couple of weeks before. 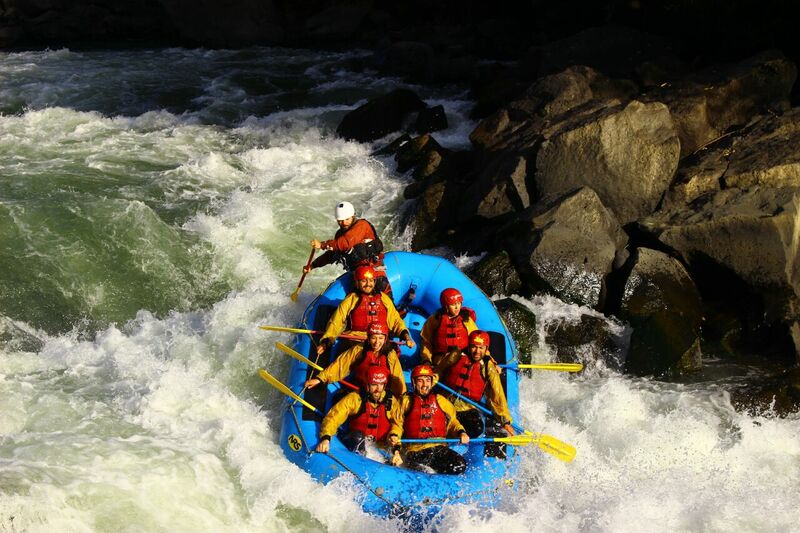 …which we spend on a short gringo rafting trip. Bus to Curicú with the bike from Santiago to avoid the main highway (or there may be some ok back routes). 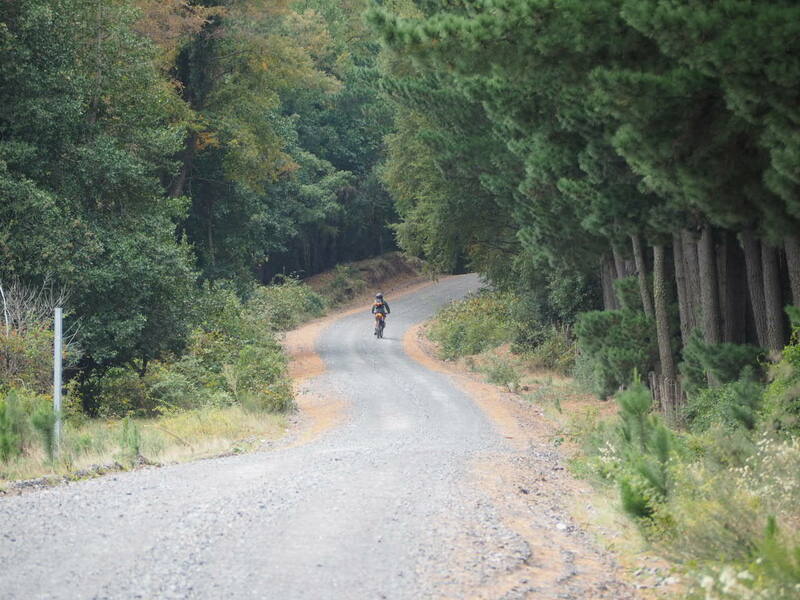 Paso Vargara has some sandy sections but is all rideable on most setups, detailed on AndesByBike. 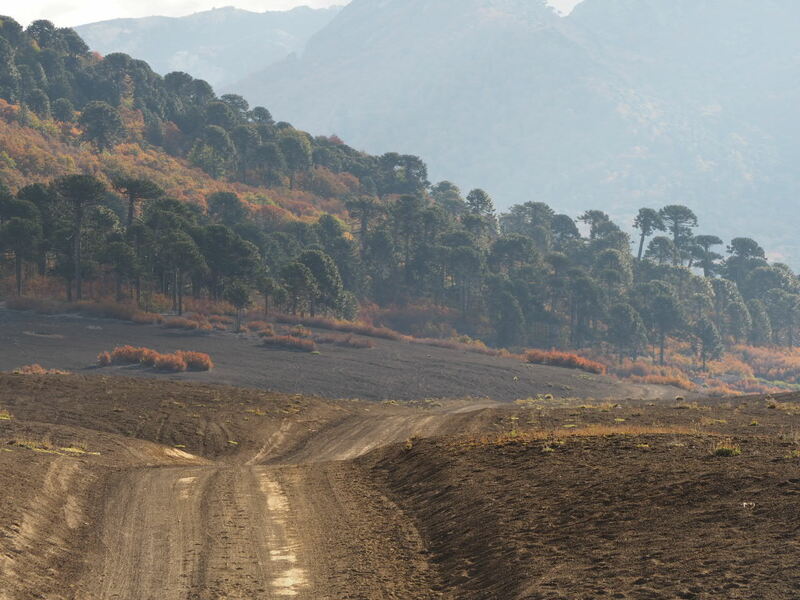 Paso Volcano Copahue requires a light setup or with a heavy setup you would need to shuffle kit to two loads for about 500 metres of rough terrain, somewhat muddy when wet (more details here by TheRideSouth.com). 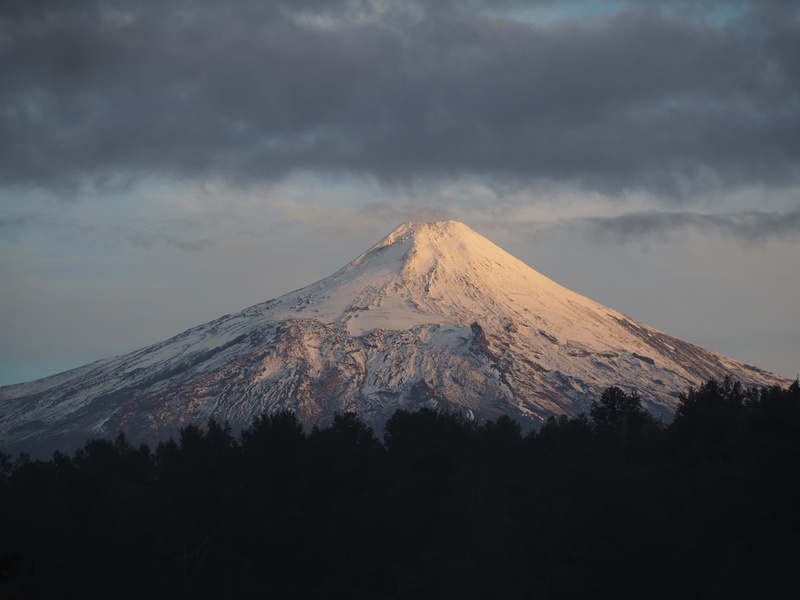 Both beautiful passes and some hot springs to enjoy in Copahue. 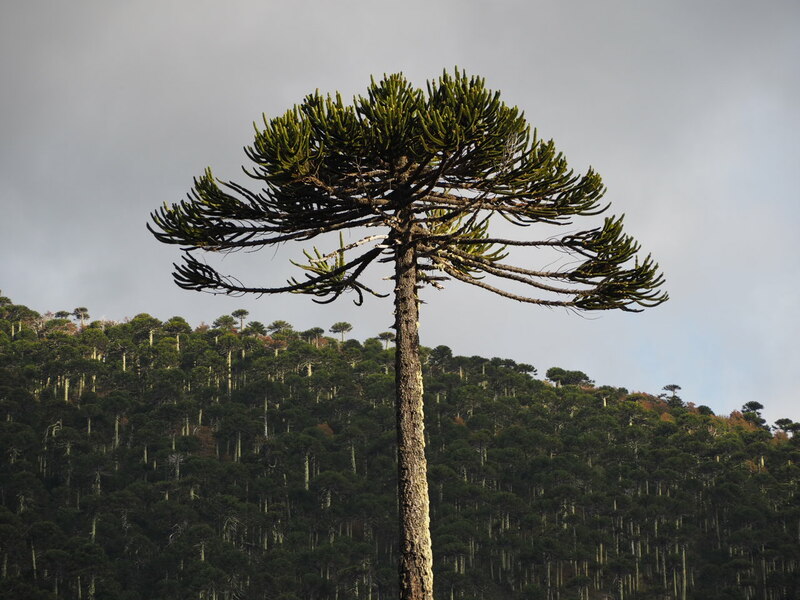 The details for the monkey puzzle trail (from Ralco to Melipeuco) can be found at the increasingly useful bikepacking.com website. 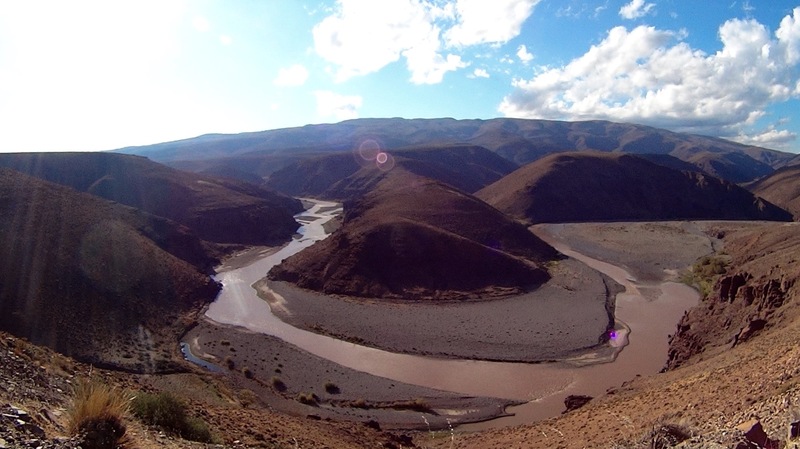 I avoided the 1000 metre climb just before Lonquimay by going via Troyo which was a pleasant (albeit steep) ride along the river. If you go via Cunco ask for the señora who also make bread – (they have a green parrot / loro verde which I think is in the name) – an excellent well valued feed. From Melipeuco to Pucón I headed via Los Laureles and then Villarica but I would suggest going via Reigolil and Curarrehue since the traffic from Villarica (town) to Pucón made for a quite grim hour and half riding (although it was a good ride up until Villarica). 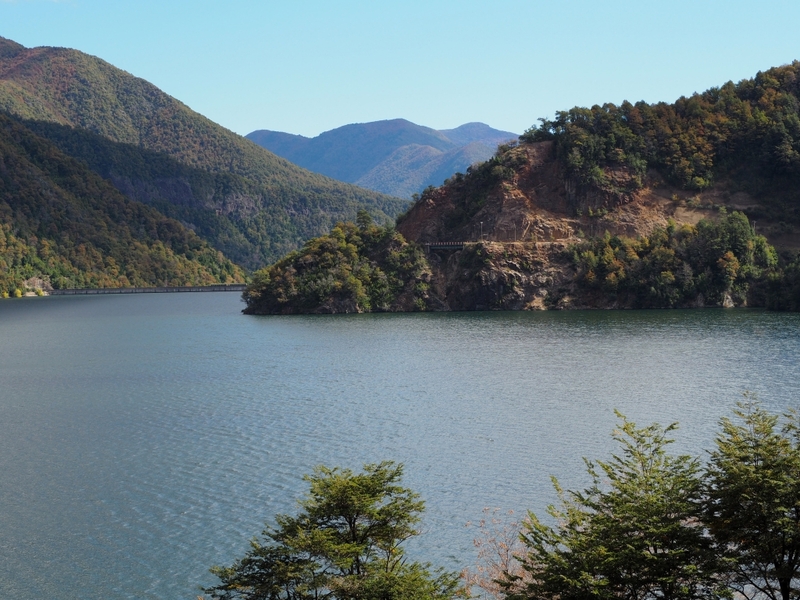 If you went the other way you could leave your bike in Curarrehue and bus to Pucón if you wanted to visit the tourist trap or just skip it all together. Pucón has a good bike shop that is pretty well supplied (El Pelao – on Colo-Colo street near corner of Bernardo O’Higgins main street) and a rafting shop with accessories etc. I stayed in hostal Palguin in Pucón which was excellent value at 10000 pesos (in off season), I saw other options for 5000 pesos though for your own room. It is obligatory to have a guide to climb the volcano and works out at a about 70000. With the bad weather in off season I didn’t do it, but it looks like it could be worth it. 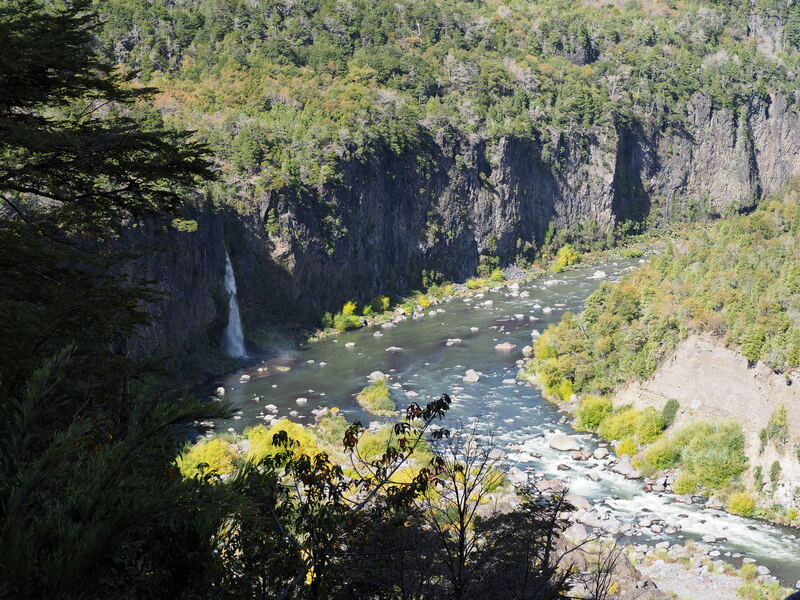 Huerquehue National Park was a nice day hike and the Ojos de Cabugua (20 minutes on the bus) was pleasant enough. Thanks John, much appreciated 🙂 Hope you are well. Thanks Anouk – good to hear from you! 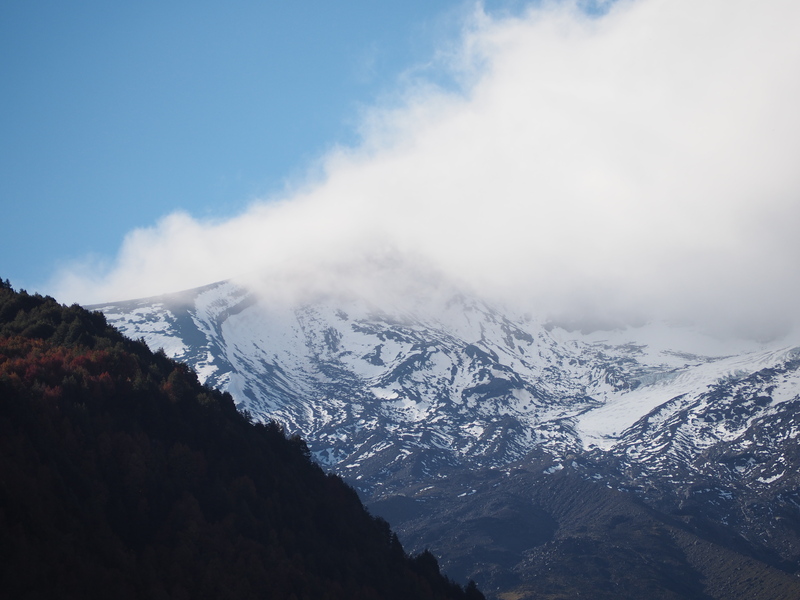 I got stamped out of Argentina in Copahue then stamped into Chile at Trapatrapa with the gendarmeria. It took some persuasion and they had to make a few phone calls though since they hardly ever need to do it! Los Angeles (Chile) I think you can also get stamped in but I didn’t want to since I wasn’t going that way.